The guitar world is saturated with distortion pedals, and this is by no means cheap, but if you're constantly switching between rhythm and lead and can't settle on a middle ground, the DS-1X could be just the pedal you're looking for. Remarkable note clarity. Plenty of gain on offer. 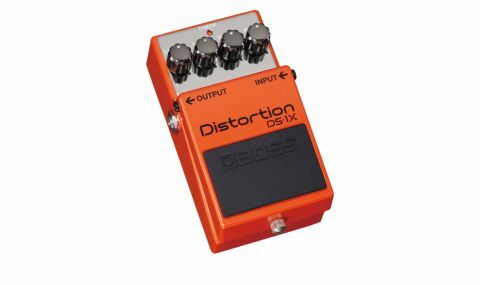 The Boss DS-1 is one of the most iconic pedals of all time, but let's be clear: this isn't the DS-1 mark II; the DS-1X is very much its own beast. As well as the gleaming panel and array of knobs (level, low, high and dist), this pedal packs Boss's Multi-Dimensional Processing (MDP), which promises 'ideal distortion tones in every register'. "There's remarkable note clarity, even on heavily distorted chords"
We're still not entirely sure how MDP works, but there's no doubt that the DS-1X offers a playing experience unlike any other distortion pedal. There's remarkable note clarity, even on heavily distorted chords, with no mud or mush, no matter how high you crank the gain. The same goes for high and low notes at the extremes of the fretboard, which retain even, cutting tones right across the frequency spectrum. Gain-wise, the DS-1X has more than you'll ever need - we found that anywhere past 12 o'clock was too much for even the heaviest of metal, although you'll yield some whopping sustain from higher settings. The high control deserves special attention, too, since fizz and sharpness can creep in with hefty gain levels.